MCGEHEE, ARK. 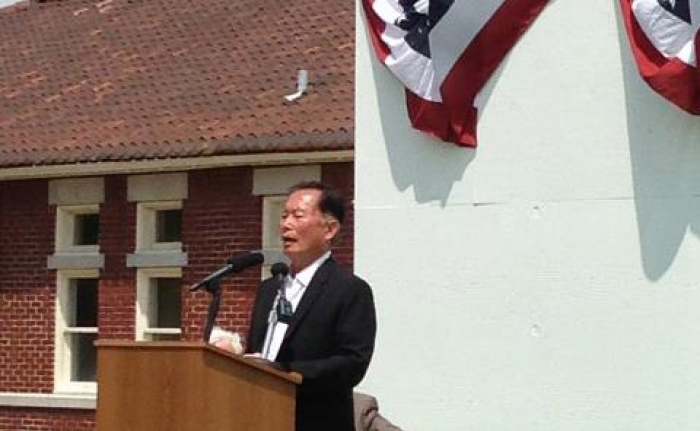 — Actor George Takei spoke quietly and thoughtfully as the Japanese American internment museum and the exhibit “Against Their Will: The Japanese American Experience in World War II Arkansas” were commemorated through two ceremonies in Desha County on April 16. The museum is located at the McGehee’s historic train depot at 100 S. Railroad St. and will serve as the Jerome-Rohwer Interpretive and Visitor Center. The dedication was sponsored by the McGehee Industrial Development Foundation, and the unveiling of outdoor exhibits developed through Arkansas State University at the Rohwer Relocation Center followed. Both projects were initiated through grants from the Japanese American Confinement Sites Program at the National Park Service, U.S. Department of the Interior. In 1942, following the attack on Pearl Harbor, the federal government forced Japanese American citizens to leave the West Coast and imprisoned them for the duration of the war at 10 “relocation centers,” mostly in western states, with two in Arkansas — at Rohwer, just north of McGehee, and at Jerome, just south of McGehee. These were the temporary homes for more than 17,000 incarcerated Japanese Americans. Takei was interned as a young boy with his family at Rohwer. The outdoor interpretive exhibits at the Rohwer site include a series of kiosks and wayside panels, with audio components narrated by Takei. Researched by students in the Heritage Studies Ph.D. Program at Arkansas State University and designed for the university by the 106 Group of Minneapolis/St. Paul, the exhibits provide a glimpse into the lives of Japanese Americans once interned there. The exhibits will be maintained by Desha County. A National Historic Landmark, the Rohwer site today includes only the Japanese American cemetery and the remains of the camp’s hospital smokestack. Preservation work at the cemetery is expected to begin later this spring under the leadership of the University of Arkansas-Little Rock. Matching grant funds for the Rohwer exhibits were provided by Arkansas State University, with support from the Arkansas Department of Parks and Tourism, Desha County and the National Trust for Historic Preservation. Matching funds and support for the McGehee museum grant were provided by the McGehee Industrial Foundation, the Arkansas Economic Development Commission, the Arkansas Department of Rural Services, Clearwater Paper Corp. and the Joseph F. Wallace Trust. The featured exhibit, created through the University of Arkansas-Little Rock Public History Program, is on loan from the Delta Cultural Center in Helena.